Decide the shape of neckline, using a template, mark around it. With an overlocker, on a narrow width setting and matching thread cut away the surplus. Use a jersey needle. Choose a stretch stitch and matching thread. Stitch then cut away surplus with scissors the correct side of the stitching. 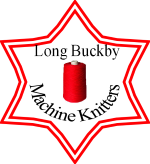 Place neck edge to knitting machine to see number of needles needed on main bed. Cast on with waste yarn knit a few rows ending with carriage on LHS. Knit 1 row with nylon cord. Change to main yarn knit 1 row on tension 8. Change to tension 6, knit 3 rows. Pick up the stitches from first row knitted in rib. This seals the band. At tension 6 knit 4 rows. down on to sinker pins. Push the needles through fabric just enough to see the hook of the needle. back through fabric to working position. Putting tension on the needles, lift knitting off gate pegs. Cast off behind sinker pins. NB If the cast off edge is needed on the right side of garment for decorative edge place garment wrong side up.